Today instead of a "regular" blog where I only profile one species, I figured I would profile a mini-ecosystem, and a traditional method of growing crop species. On campus there was a recent initiative to convert some "wasted space" (a plot of land completely over-run by Japanese knotweed, which you can read about HERE, and buckthorn, which you can read about HERE) into a garden. This isn't your everyday garden, even though at first glance you might think it is. This is an Aboriginal garden. What makes that different from a regular garden? Well, all of the plants grown in the garden have traditional uses, and some are even heirloom varieties, to Aboriginal North Americans. Many of the species grown are food crops, and they're grown in the same manner that their ancestors would have grown them, and they're growing the same varieties that their ancestors would have grown 3,000 years ago. I find this a pretty mind-boggling idea: growing the exact same genetic variety of plants as your ancestors did 3,000 years ago. Not looking up at a 3,000 year old tree and thinking "gee, I wonder how it got here" (there are very few of these left in the world, but they do exist), but growing the same food to eat that your ancestors ate. Awesome! There are a bunch of other plants in this garden other than just the three I'm profiling (including "medicinal tobacco," which is a concept I will never understand) so if you're on campus sometime next summer or fall make sure you walk around the outside of the garden and check out what they're growing (the garden is behind Collip building, near the lower greenhouses. 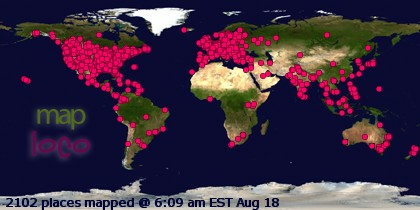 A PDF map of campus is available HERE). So let's talk about each species! 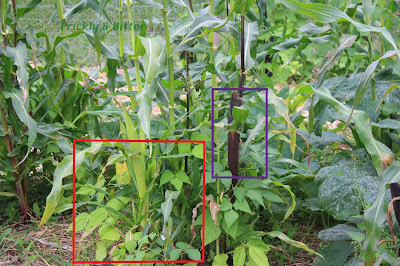 First we've got the plant that's most easily distinguished in the first image, and that's corn. Corn is a very unique plant in that it is monoecious: this means it has separate male and female flowers on the same plant. The male flowers, called staminate flowers, are at the top and are often called the "tassel." The female flowers, called ovulate flowers, can be found at the base of each of the leaves and they turn into the cobs of corn that we eat for dinner. If you are driving down a highway in "corn country" (there are a lot of farms that grow corn in Southwestern Ontario, but also a huge number of farms in the southern United States), keep your eyes peeled for corn growing in tightly packed rows with signs at the end. There would maybe be 2 or 3 of these rows, then a large space (large enough for someone to comfortably walk down and be able to take notes or photographs), and then more tightly packed rows with a different sign. This is the type of growth and the type of planting that comes with field trials of experimental varieties of corn. If the varieties don't work (don't produce enough corn, the kernels are often misshapen, are more prone to disease, don't mature fast enough, or any other number of reasons), then they are scrapped and not grown again. Farmers can "lease" part of their land to plant breeding companies for field trials, and they are compensated often by square foot; for every square foot they allow companies to grow corn, they are compensated for the amount of money they would have earned by growing their own corn on that plot. So if market value of corn is very low, there's little incentive to lease out your land for experiments. If market value of corn is very high, you could lease out a small area, not have to water or fertilize it (so lower cost for the farmer), and still get the same amount of money out of it. Good deal! But obviously all of this is an aside; I want to talk about corn, not about farming. 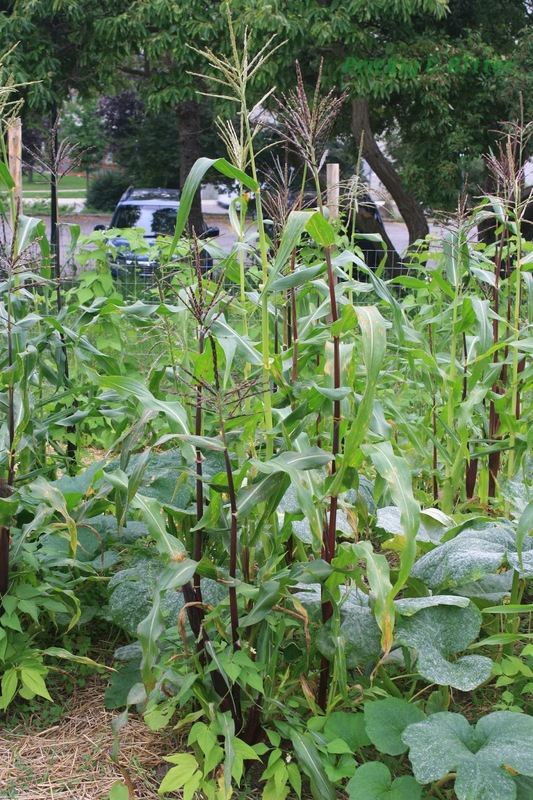 What do experimental rows of corn have to do with the biology of a corn plant? If you look carefully at these rows, you might notice something missing. It's difficult to put your finger on it if you don't know what you're looking for, but look at the tops of the plants. Do you see any tassels? The answer is more than likely you don't see any. This is an ancient practice dating back to the very first attempts at domesticating corn. People figured out very early that in order to select traits you want to propagate, you have to know who the "parents" are of the plant. Male flowers blow their pollen everywhere, and if the pollen lands on the silks of a female flower then that pollen fertilizes that flower (each kernel of corn used to be its own flower, so in order to get a fully developed cob you have to have every single flower fertilized or you get those awkward holes in the cob that no one likes, and misshapen kernels around the hole). Not knowing what pollen landed on the silks is a big problem, so if you cut the tassels off the top then you eliminate the issue of not knowing what pollen fertilized the female corn flowers. De-tasseling is a very labor-intensive process, and is rarely done anymore with corn unless a breeding program is in place. There are other, much easier ways to sterilize corn but they all involve transgenic (genetically modified) plants. If you want to see how a new variety of plant is doing, usually it's not a transgenic plant (there are many, many regulations in place for new transgenic plants and testing phases; a biotechnology company can't just walk up to a farmer and say "hey! Grow this. I'll pay you."). So what's special about corn? Well, we've managed to modify the plant beyond its biological means. What do I mean by that? 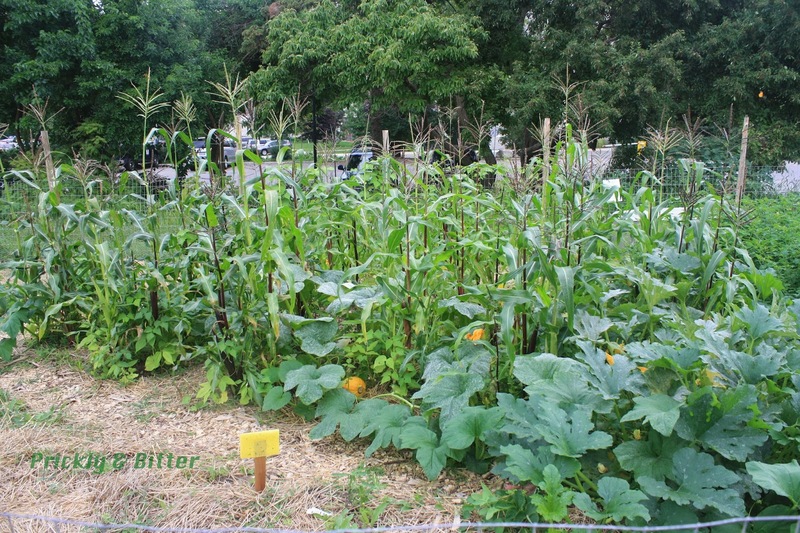 Traditional breeding (controlled crosses of plants in attempts to propagate desirable traits; something still very common in the gardening industry with food and ornamental plants) has managed to completely eliminate the possibility of the corn plant being able to reproduce on its own. 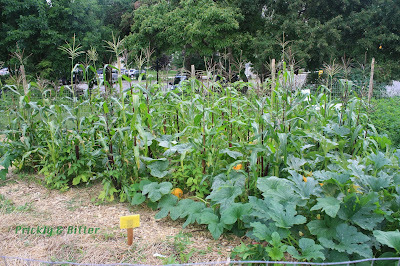 Think about the seeds: each kernel of corn is an individual seed, meant to be dispersed into the environment. How on earth is a corn kernel going to be dispersed when it's covered with all of those layers of thick husk? The husk does a great job of protecting the kernels from the outside environment (which makes a good cob to eat), but that's lousy for the plant. In fact, even if the thick husk didn't exist at all, the kernels now more often rot on the plant than fall off because of other traits we have bred into corn plants (no one wants all of their corn kernels loose in the husk, so our ancestors selected traits that kept the kernels on the cob for eating). There are so many modifications that have been made to corn that it now looks nothing like its ancestor, Teosinte. Teosinte is still relatively common in the wild, and grows like a weed. Corn? It would cease to exist in a very, very short time without human intervention. Also highlighted in this picture is one of the neat characteristics about this traditional corn variety grown: when mature, the husks around the cobs turn a dark purple. 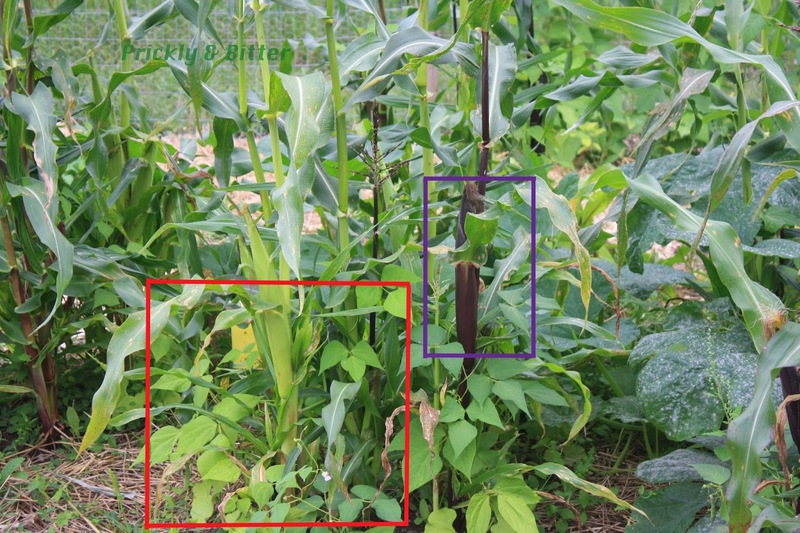 In fact, if you compare the picture above (the husk is in the purple box) to the second picture of the corn plants, you can see the drastic difference in shade of purple that the husks are of those two corn cobs. A pretty neat indicator to know when your corn is ready to eat! 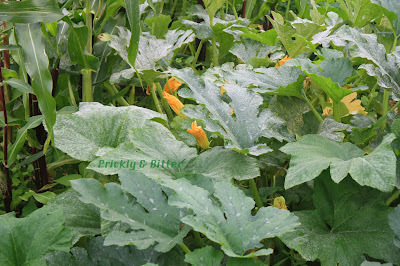 The last of the three sisters is simply known as "squash", and could be any number of species or varieties. This type sure looks like a pumpkin to me, but it might just be a type of "Candy Roaster" squash which was actually domesticated in North America (in the southern United States by the Cherokee). 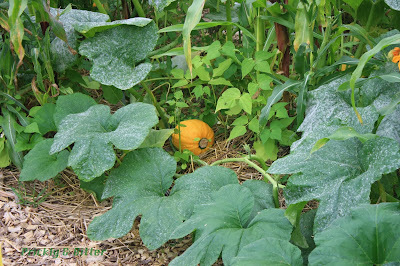 The role that squash plays in an agricultural sense is a "Jack of all trades." The leaf stems or petioles are incredibly prickly with stiff hairs, which is a strong deterrent of agricultural pests. The leaves themselves are enormous, which provides a great amount of shade at soil level. 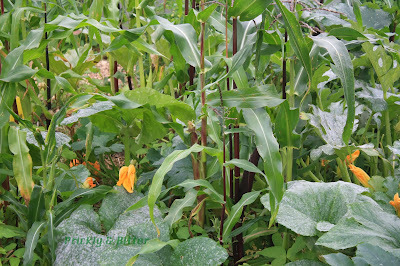 This does two things: first, it creates a cooler microclimate at the base of the corn stalks so that the hot soil in the heat of summer doesn't burn the stalk, and second it shades out any weeds that might want to grow in the garden so the corn and beans can use all the soil's nutrients. The nutritional side of the squash is two-fold. First, it contains a huge number of nutrients that the other two crops don't have but are necessary for proper nutrition like vitamin A, many of the vitamin B complexes, and vitamin C. It also contains quite a bit of sugar compared to starch, so can be used to sweeten a meal and impart flavour (corn and beans on their own don't taste like much, it's the liquid you cook them in or the spices you add that make them taste good). The seeds of squashes are also incredibly nutritious, but can also be pressed instead of eaten and used as cooking oils. If dried properly, the seeds can also be ground into a paste (the North American version of hummus? ), or into a fine powder and used to make bread. Now that I know this I'm on the hunt for squash-bread. If you know how to make this, please let me know. It sounds delicious!